In this step, you will create an abstraction to hold the Product, Manufactured Product and Supplied Product entities. 1. Ensure the model you created in the previous tutorial is open. 2. Drag the Abstraction shape from the Document Stencil onto the model diagram. 3. Give the Abstraction a name of Product Entities. 4. You now want to add objects to the Abstraction. Select the Abstraction menu and choose the Specify Objects… option or right-click the Abstraction shape and select the Specify Objects… option. A list of all objects is shown in the left pane. A list of entities within the abstraction is shown in the right pane. 5. 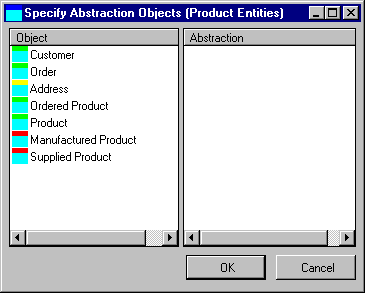 Add the Product, Manufactured Product and Supplied Product entities to the Abstraction by double-clicking them or by dragging them to the Abstraction list. As you add objects to the Abstraction, they are removed from the Object list. To remove objects from an Abstraction, double-click them in the Abstraction list, or drag them from the Abstraction list to the Object list. Note that you are referring to objects, as well as entities. Other Abstractions can be added to an abstraction. 7. Select the Abstraction by clicking on it. 8. Hold down the Shift key and select the objects you wish to add by clicking on them. 9. Release the Shift key. 10.Add the objects by selecting the Abstraction menu and choosing the Add Objects option, or by right-clicking the Abstraction and choosing the Add Objects. Objects can be removed from an Abstraction by using the same selection method and the selecting the Remove Objects option.